Jim Key is a founding member of UUFB. He served as board president for five years, vice president then president of the Thomas Jefferson/Southeast District. He facilitated the organizing meeting for the Southern Region of the Unitarian Universalist Association, and served on several committees at the UUA which included chairing the UUA Audit Committee. Jim Key was elected to a single, six-year term as moderator at the June 2013 General Assembly. The moderator, the highest volunteer position in the Unitarian Universalist Association (UUA), is the chief governance officer for the Association. 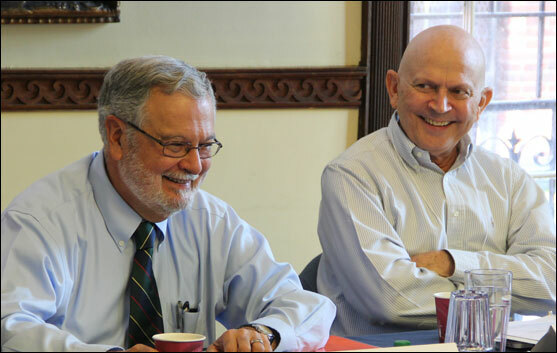 The moderator chairs the UUA Board of Trustees, facilitates the plenary (business) sessions at General Assembly, serves as an important interface with congregations that comprise our Association, and consults with the president in developing a common vision for the Association. The moderator also consults regularly with leaders and administrative committees at the national, regional, and district levels.